Many customers have used our Amish Console Cabinet in their foyer, as a place to leave car keys and other daily pocket essentials as they come and go from home. A quality, rustic cabinet is a beautiful way to set the tone for your home as guests arrive! This cabinet is available with a number of finish packages including beautiful distressing and antiquing. Please call to speak to a furniture specialist with any questions at all! 1-866-272-6773. 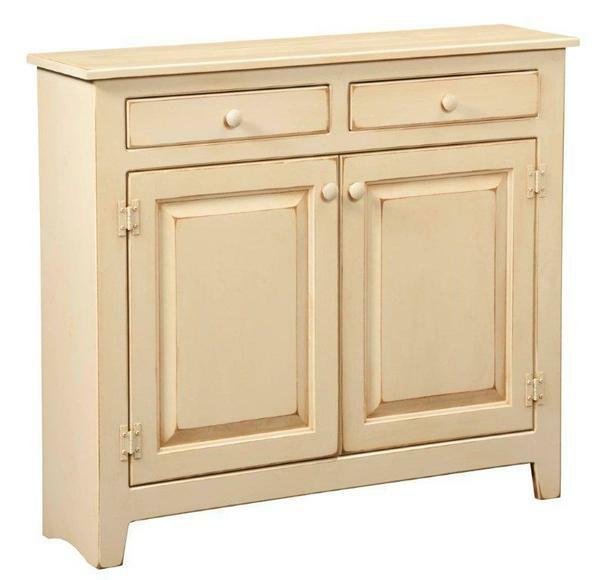 This Pine cabinet is shown in a buttermilk painted finish and features two adjustable shelves. Who knew storage cabinets could look so beautiful! This pine furniture is sure to make a statement in any room of your home or business.